Home / Health / Isabelle / Lifestyle / Medicine / Video / What every Cancer Patient needs to know? 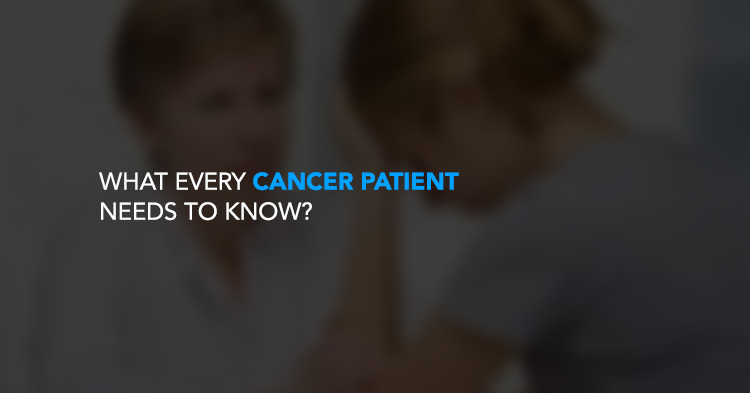 What every Cancer Patient needs to know? A cancer diagnosis always is like a death sentence to anyone. The emotional and psychological effects are so distressing not only to the patient but also to their family and loved ones. Some people fear cancer itself, while others are afraid of cancer treatments and wonder how they’ll get through them. The fear of pain and suffering is one of the greatest fears people with cancer and their loved ones encounter. But there is no greater fear than fear of imminent death as we are fully aware that cancer continuous to claim a lot of lives. Related article: Does Chemotherapy really Cures Cancer? When I was first diagnosed with breast cancer 10 years ago, the only thing I knew is that it kills and I that am going to die very soon! Barely knowing cancer plus the added pressure from my family led me to agree to the treatment of 6 rounds of chemotherapy. If I had only known what I know now about cancer, I would have made smarter decisions then. What is Cancer and its Causes? Cancer is a diseases characterized by out-of-control cell growth. There are over 100 different types of cancer, and each is classified by the type of cell that is initially affected. Cancer harms the body when damaged cells divide uncontrollably to form lumps or masses of tissue called tumors (except in the case of leukemia where cancer prohibits normal blood function by abnormal cell division in the blood stream). Cancerous tumors are malignant which can grow and interfere with the systems of the body, and can release hormones that alter body function. Tumors that stay in one spot and demonstrate limited growth are generally considered to be benign (non-cancerous). We all have a risk of developing cancer. Many cancers seem to develop for no apparent reason. Cancer has been around as long as mankind, but only in the second half of the 20th century did the number of cancer cases explode. Contributing to this explosion are the excessive amounts of toxins and pollutants we are exposed to, high stress lifestyles that zap the immune system, poor quality junk food that's full of pesticides, irradiated and now genetically modified, pathogens, electromagnetic stress, lights, and just about everything that wasn't here 200 years ago. There are many controversies in the war against cancer. One thing that we are certain though is that cancer cannot develop and take hold in a body with a sufficiently strong immune system. We all have pre-cancerous cells in our bodies and every day, the body fights off or destroys cells which it identifies as harmful. A healthy immune system is able to destroy rogue cells so they are prevented to duplicate and grow to form a tumor. Many cancer victims thought that they had led very healthy lives but their cancer proved otherwise. Cancer treatments are complicated and most often overwhelming so it is best to understand your diagnosis and treatment options. Cancer treatments are commonly classified into conventional and natural therapies. Conventional treatments refer to traditional form of treating cancer, most common and widely used are surgery, radiation and chemotherapy depending on the type and stage of cancer. These are invasive in form, frequently painful, debilitating, tiring and have harmful side effects which sometimes last even after treatment. Other treatments are targeted therapy, immunotherapy, stem cell transplant and hyperthermia. Natural treatments are by definition cancer treatments which come from Mother Nature. They are more commonly called "alternative cancer or non-traditional treatments," which are non-invasive and don’t do any harm to the body. Intravenous therapies, diet and nutrition, detoxification program, supplements, acupuncture, visual meditation, biofeedback, etc. are just a few of the many proven and effective treatments that yield good results in coping and recovering from cancer. What to do when diagnosed with Cancer? "Cancer" may be the most frightening word you will ever hear. Then life changes suddenly and profoundly after a cancer diagnosis. Initial shock gives way to a realization of the tremendous physical, emotional, and spiritual challenges that lie ahead. But beyond the emotional turmoil that accompanies a cancer diagnosis, patients face a practical necessity: to develop a plan to live with and fight cancer. Having cancer is a personal journey but you need all the support you can get from family and loved ones. Never feel alone or blame yourself for having acquired cancer instead focus on how you should deal with the disease and beat this! Hit cancer hard. This is one fight you don't want to lose. Fighting cancer is very difficult and takes a great deal of commitment. But with the necessary knowledge, you can strengthen your body and empower it to more effectively fight the cancer. Remember, just because people before you have died of cancer, or even your type of cancer, does NOT mean you will too. Research on your diagnosis and know more about other treatment options aside from the conventional. If you look hard enough, you may find that in many cases, alternative therapies may yield better results. Remember that only your body has the ability to heal itself. Your job as cancer victim is to be educated. This is the time to become more diligent and aggressive regarding your health and nutritional program in order to boost your body's ability to fight cancer cells. You have a long and difficult task ahead so stay positive and be in control.